he was able to deftly fill in the hole with some walnut, albeit a darker wood. When you ran your fingers across it you couldn't even tell it was there. I then set about trying to stain the wood to match my other woods, and it actually came out a bit closer (less red after the Brownells dye was added) than my original stock. It still has some drying to do, but overall I am happy with the results. Curiously, the darker wood ended up staining lighter, so there is no mistaking a patch is in place. Would have been perfect if I was going to the British Lend Lease look! Mark "MP40": Happy? Happy now? Thanks for the impetus. How many coats of stain did you have to use and is it true the more coats you apply the darker it gets or will it only get so dark? I purchased an original set (buttstock and hortizonal forgrip) from Mr. Iannamico (Frank) last year and the original sling mounts were filled with the sling mounts relocated to the side (right side, I think, I'll have to check that?) of both peices. You can tell the difference, as it your case (little different color), but they still look good. Question, My 28 has the front vertical grip style on it and I would like to use the original lend lease buttstock I got from Frank, but I want to use the original front vertical grip, can I have it drilled and countersunk on the side or will it make it to weak and prone to break? I think I saw an old picture somewhere that had this lead lease type set-up? Looks real good! It looks just like the relocated sling swivels on the British Thompsons. The plugs didn't match the stain on the originals either. Nice job! I had, in the past, considered adding a sling swivel to my vertical grip, and my hold-testing seemed to indicate countersinking may not even be needed. I don't think you'd have to worry either way about breaking, IMHO. I think the Brits put swivels on both sides of the verticals, but I could be wrong about that. Staining this hunk of wood was trial and error. When I said it was raw wood, I lied. I recall adding one coat of boiled linseed oil about six months ago, but sanded it pretty good before staining this time. I added three coats of jacobean stain and one coat of walnut, because to my eye it was coming out too light. 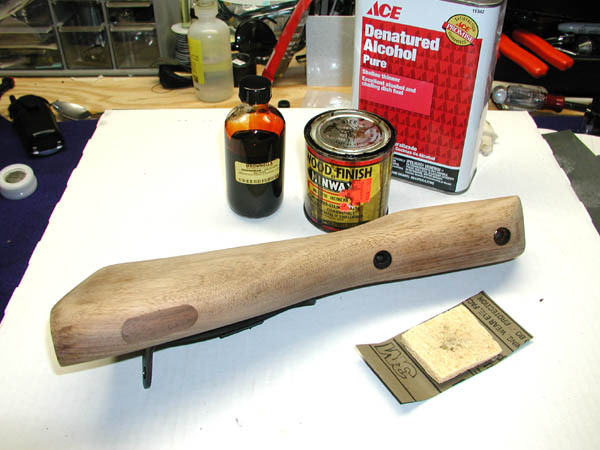 Then I dunked it in boiled linseed oil before adding the red Brownells dye. Then one more coat of linseed. This stock didn't behave as well as the first one. It is exuding stain! Gonna have to let it sit for a week or so and re-evaluate. The wood should darken with each coat, but I think my pre application of linseed months ago reduced this effect. They say the linseed will darken with age, too. Yes, I am Chris! it looks great! now......all you need is an compensatorless front sight to complete the gun! (IMHO!) as I just love the 1921 look! strange...along time ago, I despised the vertical forgrip and the compensatorless look,as i prefered the 1928 military version of the Thompson! I, too, prefered the military look. Then I discovered Doug Richardsons vertical foregrip. I did not want to make the Westy 1928 "look" like a 21 per se. I recently discovered a reference in a 1936 AO catalog of a 1928 with ring sight, which I gather would have been the first 1928 offered. The Cutts was an option. So, I may yet lose the compensator and go for the "early 1928" look. That way I can at least say it isn't a 21 look alike, but modeled after the original 1928. Makes me feel better anyway, even if it makes some others cringe. Got home and checked out the wood I got for from Frank that we talked about earlier, I was wrong . The buttstock has the sling swivel countersink in the top, not on the side (I knew that!!!). The hortizontal forgrip has the countedsink on the left side, about 3/4" back from the front (about the same as the orginal countersink, on the bottom) of the grip to the front of the swivel and is cut so the bottom edge of the swivel is even with the bottm of the grip. It's the M1 style with the cross bolt and it has an "S 51" stamped in the side of it. I'd say the "S" = Savage, but not sure what the "51" stands for ? Color looks petty much the same as yours, deep brownish/redish color. After looking it over, I'm not sure that the vertical grip would have much of a bite left for the screws after you countersunk one of the milled swivels down far enough to seat it? The only vertical grip with swivel I've seen, page 46 of American Thunder, doesn't look like it was countersunk. Would it need to be? I'll take a look in my copy, page 46, OK got it. I cannot recall how your westy is stamped on the side, 1928? or ? Also, That 1936 AO catalog sounds pretty cool! any prices in it? good point that the compensator was an option! (evidently a popular one too!) I wonder what the compensator cost in the 20's and 30's? Beautiful work. I love that patch job; looks just like they used to do it. 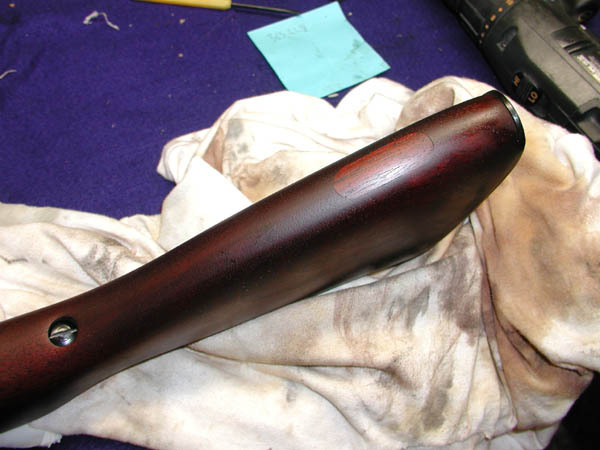 Good staining job -- very deep rich color! My West Hurley is stamped US MODEL 1928. Yes, the Colt 1928 Navy model was offered with or without a compensator, just as all the Colt models were after 1926. The compensator was introduced in 1926. The model you describe in the 1936 catalogue was not the 1st type 1928 offered. In fact, the 1928 Navy model was introduced with the compensator being "standard." The model was also offered without the compensator as well as the choice of vertical or horizontal fore grip. In reality, most 1928 Navy models sold had compensators and vertical fore grips. The 1928 Navy model without a compensator or having a horizontal fore grip is a actually a pretty rare version of the Colt guns. Go for whatever suits your fancy! Yah, a Colt 28N without a second type Cutt's and a horizontal grip are rare species. The 28N with comp was the most expensive version of the Colt. Now that the owner of the U.S. Model 1928 West Hurley has patched the underside buttstock sling swivel to suggest the look of a British Lend Lease model, he might as well stick with the military theme Thompson, and retain the West Hurley "Cutt's", and save the $400 for a second pattern original Cutt's. I moved the swivel to the left side on a horiz grip, to the right on a vertical. Found that if the swivel is on the left side and you sling the rifle over a shoulder, the magazine release can foul and drop the magazine. Not an issue if you sling the rifle at the ready... never know when a crazed rock chuck is going to bounce you. My stock, bit the worse for wear, a Kahr stock, I used dowels in the plug, and I'm not exactly a polished hand at this. THe dimple at the bottom is Kahr's, they really wanted those sling swivels to stay put. It doesn't look to bad, I'll bet if you take it someone like a cabinet maker he could strip-it and make it look like brand-new . Thanks for the tip on the pictures for the sling swivel mounted on the front vertical grip, that's just what I was looking for. It's been some time since I've read through the T.C.N. (Thompson Collectors News) , lot of great articles and pictures to look at. Gleat! Oh thas' gleat! Scene one! One day, I WILL find an original British modified vertical grip to go with my original British 1928 buttstock (with the swivel on top). Until then I'll have to make do with a modified horizontal. A buddy loaned me a vertical to use on a show display (but I don't remember if it was real or made up). I have a Canadian proofed M1A1 buttstock (beauty, eh) somewhere around here. I can't remember if it had a top or bottom swivel. I have a colour photo from a British military museum in a book which features a British LL Thompson and the mount on the left side of the vertical grip appears to be inletted. I like the M1 TSMG, I like the 1921, but an unmollested British proof 1928 Savage is my dream Thompson Can you spot the Thompson in the photo? And then I'd be afraid of scratching it! I don't remember if you asked, but in wartime photos, the location of the sling swivel (left or right) seems to vary. It might have been that article that suggested that maybe it depended on the handedness of the shooter, but I've an acquaintance that got a boot for shooting left-handed on an exercise. The right hand being the one they were taught. Hence I added my observation about the magazine release fouling when you put the sling swivel on the left. Then again, in training, they took the magazines out generally it seems. Bier und Waffen, nice little collection. I have an original British buttplate on the stock above. LOL. I think what Laidler calls a back alley job. It's a kahr, not a piece of history so I took liberties with what I had on hand so I could add a trap for an oil bottle as well. Hard to display the grenades, but aren't they usually tucked in the pouches, being equal opportunity armament?